Summer fishing on the Attitude Adjustment. July has come and gone. The fishing was pretty decent. The weather has been just down right Hot! One thing about summer fishing is there is a lot of options. Offshore, the bottom has been a little slow. Near the surface there has been some Kingfish, Amber Jacks, and the Bull sharks are around and holding some Cobia if you are lucky. Inshore the Snook bite has been decent. But remember the season is closed until September 1st. There has been a few Redfish on the outgoing tides, they are taking crabs. There has been a few Tarpon on the beaches around some of the bait pods. Sebastian Inlet is always a great place to fish and is also a very cool place to dive in the summer when the water is clear. Usually best on the incoming tides. I have been super busy in July. Fishing and working on the Attitude Adjustment II which is coming along nicely. Booking Offshore trips soon enough. Lets hope for a great August and Sept. 1st will be here before we know it. Mid-July fishing aboard the Attitude Adjustment. June-July has been decent. We have had some cold water here and there. The bottom fishing has been hit and miss. Mangroves, Cobia, and Kingfish are what is most likely. The Threadfins have been pretty thick up and down the beach. Around the Sebastian Inlet the fishing has been pretty good as well. The Snook are feeding and the Redfish are taking crabs on the outgoing. 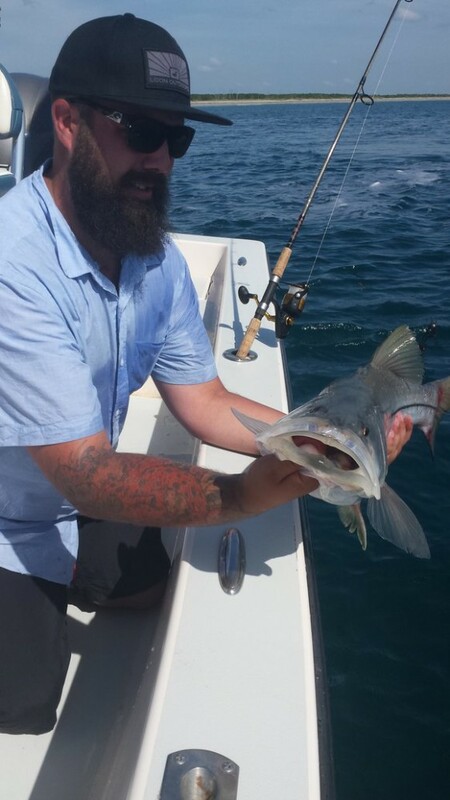 There have been some Tarpon, Sharks, and Jacks along the beaches around the schools of bait. The weather has been extremely hot. There have been some afternoon thunderstorms but that is pretty normal for this time of year. The Attitude Adjustment II is coming along nicely. Probably another month and she will be ready for trips. So let me know if your interested! Thanks again to each and everyone who continues to fish with Attitude. 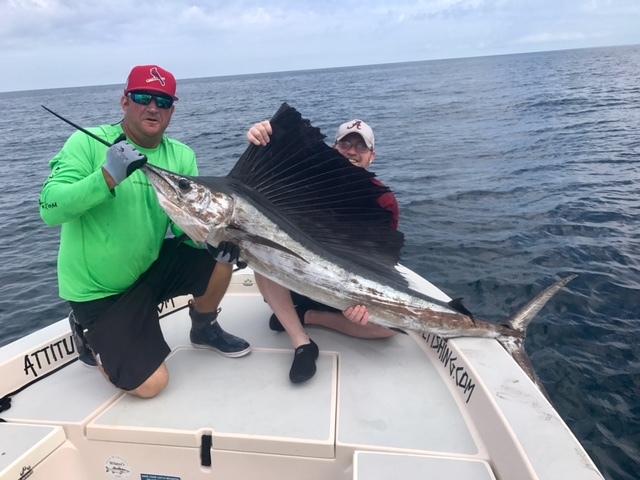 Mid May fishing along the treasure coast. Wow, It has been a little over a month since my last post. I need to quit slacking and keep up. I have been super busy fishing and just living Dad life. The full moon right now has everything a little slow. Hopefully once we get away from this full moon the bait will show back up. Offshore- The Mangrove bite at night has been decent. There are a few Dolphin around in the 180ft. -250ft. range. Grouper season is open! Hopefully it stays calm enough to get out some more and fish. Imshore- The Snook fishing is tough right now, though we have had one of the best springs that I have ever seen. Bait is just difficult the last week. 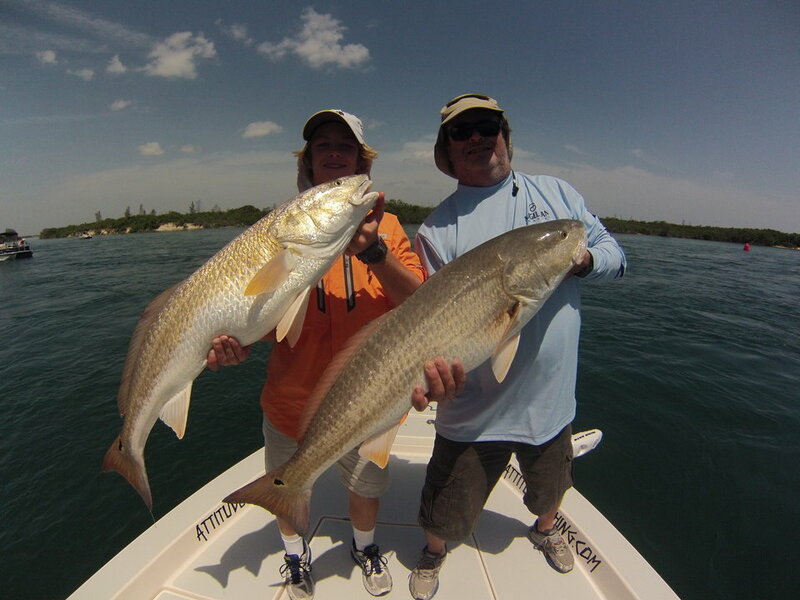 There have been some Reds on top around the Sebastian Inlet. They are sucking down crabs. Big school of Jacks up and the beach, lots of fun on top water. 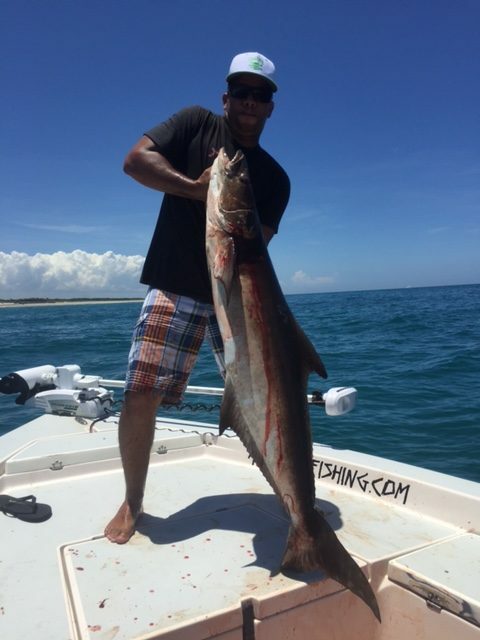 Mid-August, Sebastian Inlet reports with attitudefishing. Inshore- The water is still cold in some areas. The fishing is kind of hit or miss. The Redfish have not been affected by the cold water. In fact they have actually been eating more. The Snook are kind of slow moving. With water temps in the low 70’s the bite has been slow. 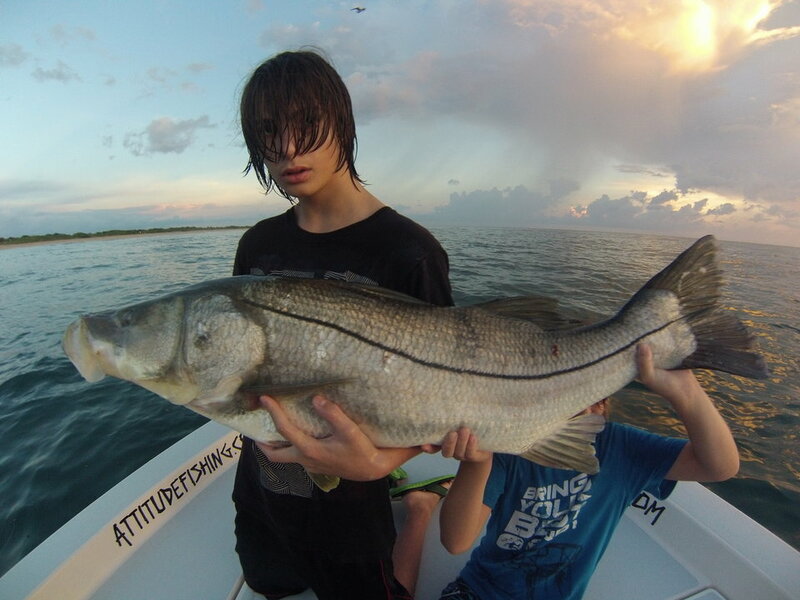 Snook season is Sept. 1 so book your days now. Offshore-The bottom is still cold and the bite is slow as well. The Amberjacks are in full swing though. The Bull sharks are all over the 90ft. stuff. Look for Cobia with them. 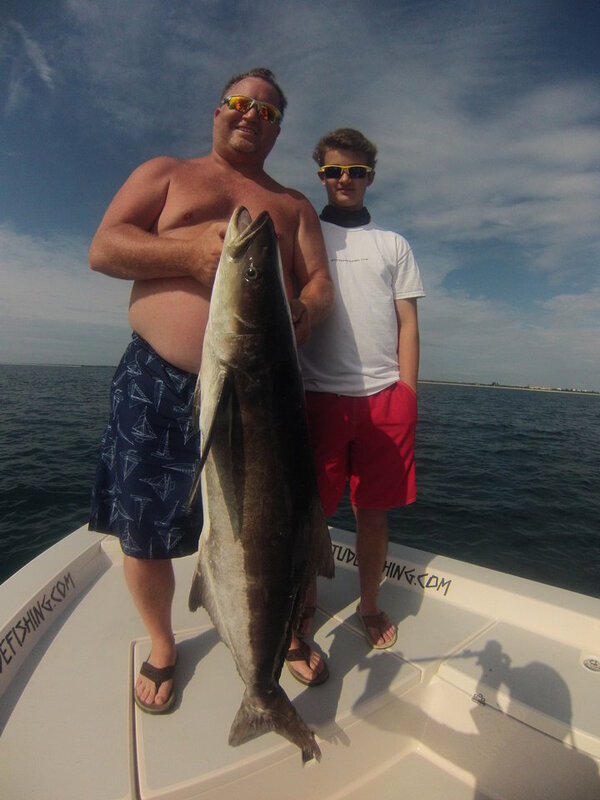 We have had some really good Cobia days the past couple of weeks. I also have heard a few reports that some Dolphin are starting to show up out around 150Ft. I have had some great trips this month but I also have had some time off. I have been just relaxing and getting ready for Snook Season. Thanks to everyone again who help support my dreams. Hopefully you have enjoyed fishing with attitude as much as I enjoyed fishing with everyone. Tightlines! Sebastian Inlet fishing aboard the Attitude Adjustment. The weather has changed a bit. The winds have picked up out of the east. The ocean is blown out and choppy. The moon was full on the 20th. The forecast says the weather is going to calm down before the weekend so hopefully we will get back to the flat summer conditions. Offshore- Before the winds started the bottom fishing had slowed down a bit. We were still catching a few Snapper but just having to work a little harder. A few smaller Kingfish on surface baits. 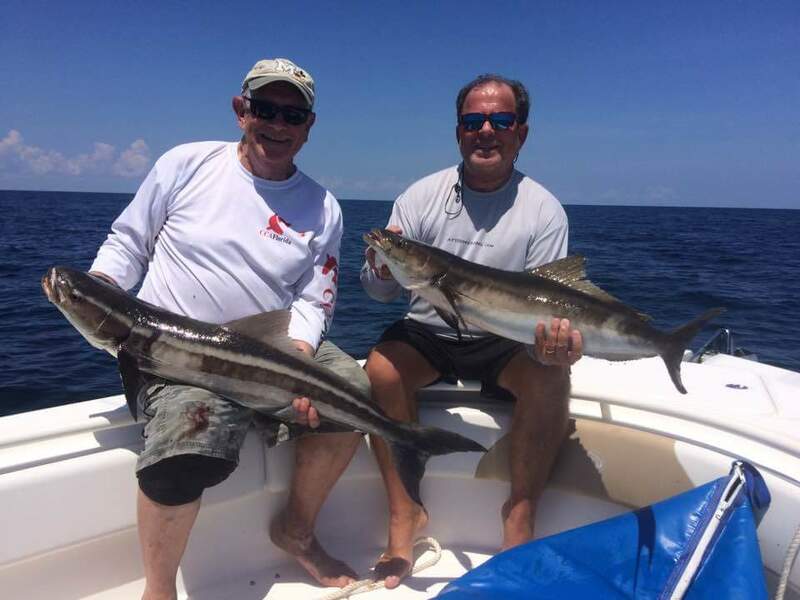 There also a few reports of Cobia around. If your lucky you might even get a Dolphin to swim up to the boat so always have a rod ready with a live bait hook. Inshore- Along the beaches the Bonita are still going off on the glass minnows which are a lot of fun on light tackle. Also some nice Spanish Mackerel along the beaches. The Snook are spawning in the surf along the beach. The Croakers are close to the beach and work great for the Snook. Make sure to safely release the out of season Snook. Redfish and Jacks have shown back up inside the Sebastian Inlet. 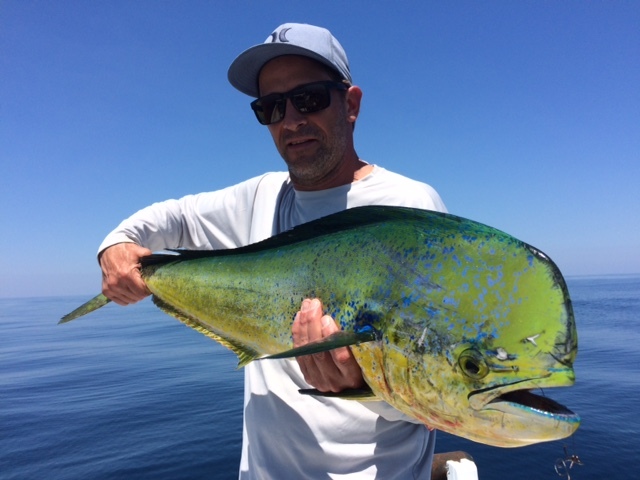 Some highlights of last week, Mike catching a nice Dolphin that swam up to the boat while we were bottom fishing. Ryan and his son catching a big Goliath. Thanks to everyone who fished with Attitude the past week. Hope everyone had a memorable trip! Please if you read this and have a second, drop a comment! Thanks again! Summer fishing family fun! Attitude Adjustment! Summer fishing family fun! Attitude Adjustment! June is here and the heat that comes with it. We have had our first tropical storm already which has brought tons of rain to the Sebastian Inlet area. Snook season is closed. Memorable moments from the past 2 weeks, Jeff and his son Blake catching a 40lb. Cobia. Doug, Jim, and Stephanie from Saltwater and Sport fishing Magazine having a good day aboard the Attitude Adjustment. Inshore fishing has been rather slow. The river water is dirty with all the fresh water being let out of the St. Sebastian River. Along the beaches we are finding some schools of Jacks and some Tarpon roaming around. A few kings on live bait in the 40ft. range. 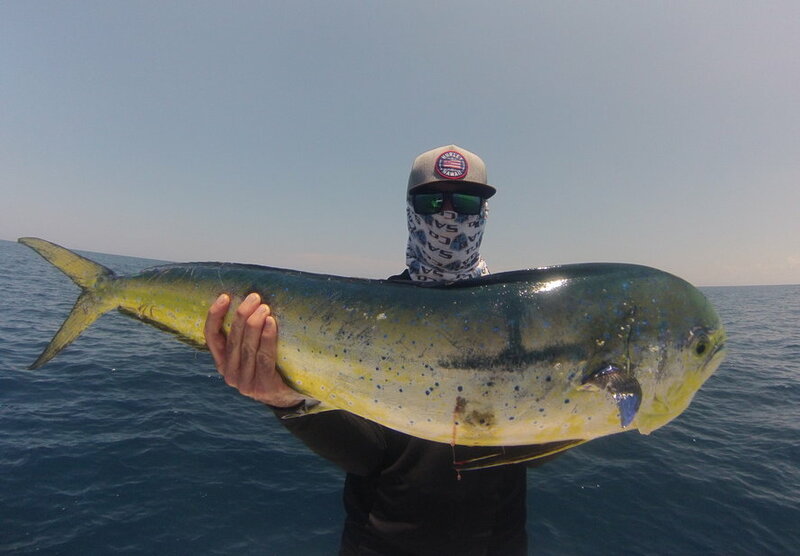 Schools of Bonita are frothing along the beaches, which is great fun with light tackle. 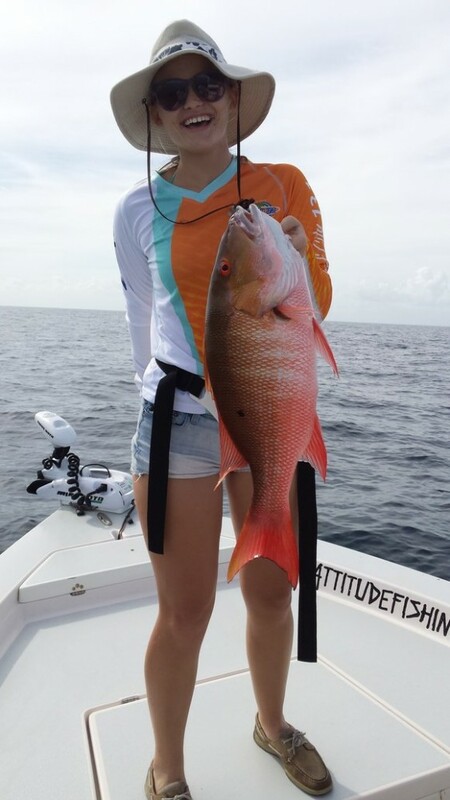 Offshore fishing, Bottom fishing is good with some decent catches of Mangrove Snapper and of course Red Snapper. A few Cobia are showing up curious and ready to take a bait. The Bull sharks are also in force but no Cobia on them. Amber Jacks are pretty thick and hungry so bring your muscles. The weather is pretty flat and calm, so get out early and get in before the afternoon thunderstorms. Thanks to everyone who fished with Attitude the past few weeks. Hope everyone enjoyed there trips. You know I would love to receive comments here on this site. So please take a few minutes and drop a positive comment. Thanks again! Big Snook and Slot Reds on Attitude Adjustment. Scott, Jake, Noah, and Carlee had a great morning fishing with attitude. We started off from the Inlet Marina at 6 a.m. It was raining but did not stop us from Snook fishing. We hooked up instantly. The bite was on fire. Everyone caught some big Snook. We could not get a keeper. They did however catch 3 keeper Redfish and a nice Mangrove Snapper. Once the tide slowed down we moved into the inlet and made some drifts and had some fun with the Jacks. We finished up catching a couple more Snook then decided to call it a day. Thanks Scott for bringing your family fishing with me. It was a pleasure to fish with you all. Thanks again! Redfish, Jacks, Snapper, and Trigger aboard Attitude Adjustment. Brian, Eric, and Connor first time fishing with Attitude. We started off catching Croakers. The tide in the Inlet was outgoing till 9 a.m. We started fishing around 10 a.m. and started hooking up left and right with Jacks and a few Reds. We a few double ups and even a triple. We tried for Snook but never had a hit. We went back to the Reds and Jacks but never had another hit. We went for a ride down the beach and never seen any action. We stopped at a few rocks and did some Snapper fishing. We caught about a dozen Lane Snapper and even a nice Trigger. They were able to take home some fresh fish. Brian, Eric, and Connor thanks for fishing with Attitude. It was a pleasure to meet and fish with the three of you. Hope to fish with you again in the future. Fishing the boils in Ft. Pierce. Robbin and Kyle from Canada are here for icast. I picked them at there hotels dock. We went straight to the boils and starting soaking some crabs. No luck with the crabs, never seen a permit all day. We switched baits to Croakers and Robbin instantly hooked up and landed a nice Snook. Robbin also caught another Snook a few minutes later. Kyle had a hit as well but pulled the trigger a second to quick. That’s was it with the Snook, we never could get another hit. We ran the beaches in search of the Cobia but no luck there as well. We finished up back at the boils. Kyle caught a decent Mangrove, not much else happening so we decided to call it a day. Robbin and Kyle it was very nice to meet and fish with both of you. Thanks again and sorry the fishing was not more productive.